Back to basics tip #30: I have two emergency bags in the trunk of my vehicle. One is the car emergency kit and the other is my mom emergency kit. I stock it full of stuff that may come in handy in mom emergency situations with children. » Tell me… What do you find a necessity to have in your car for your children? I do this too. It has saved us many times. The hardest part is remembering to go though it every few months to make sure the clothes are for the right season and the diapers still fit! I added a few books, crayons and small toys to mine, for those unexpected outings or restaurant visits. 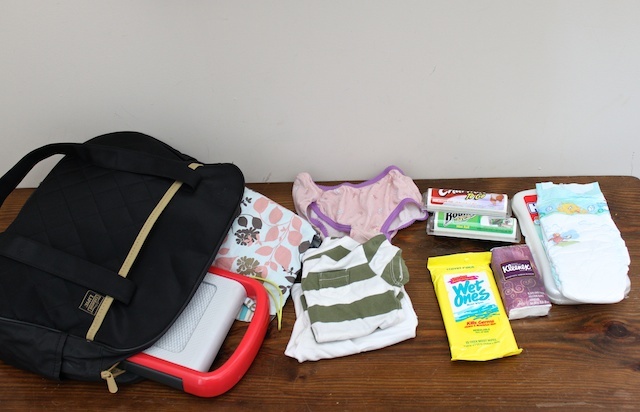 I use a large diaper bag so most of those items I keep and lug around in the diaper bag at all times because I’m a worrier. lol But it’s actually saved us a few times! In addition to that I always keep an extra jacket, heavier blanket and water in the car. The paper towels is a great idea that I didn’t even think of though! Oh yes I have the same things in my car. I try to have an extra plastic bag and reusable bag in there as well. You never know when you might need a bag. Like Lynne, I’m always forgetting to double check it and replace clothes that mat not fit. What’s funny is that with guy writing thus, I need to put new diapers in the bag. Thanks for the reminder. Right now mine just has some diapers, wet wipes, and a few toys. The funny thing is that I’ve used it more for non-travel emergencies than when we are away from the house. Like 10 minutes before bedtime and husband comes out from my daughter’s room and is like, “Um, I’m changing Aubrey’s diaper and we have no diapers…AND she’s poopy.” Perfect. Markers/pens, paper, mini magna-doodle, and etch-a-sketch are a must for my older boys in our car. I used to carry around extra clothes but stopped once the blowouts stopped and after forgetting to rotate out the too small clothes (and diapers). Now I just have a diaper changing pad stocked with diapers and wipes and a plastic bag in the car just in case. I use the wipes to clean hands, faces, etc. Also I bring a sippy cup and snacks wherever we go, in my purse. cute blog, btw. just found it via a search for diy mustaches on sticks. We have what we call a “puke bag” in the car. My 3-year-old gets carsick, so we keep a bag with paper towels, club soda (for cleaning up puke stains on the car seat, floor, etc. ), febreze (because puke is smelly) and plastic ziplocs. As soon as we stop carrying a diaper bag, I’ll need to start carrying extra clothes in the puke bag too. Add in scissors or a sharp pocket knife… Kids like to mess with seatbelts, hoodie strings and anything else they could possibly strangle themselves with and having a quick way to cut them loose might save their life. A first aide kit should be in there too. In mine for a 2yo, 5 1/2 yo, 7yo and 11yo I keep both of the above, diapers, wipes, hoodies, spare stretchy gloves and hats in winter, a small blanket for everyone, snacks, a case of water, colored pencils cause crayons melt and blank doodle pads (their pencils are in a case with built in sharpeners) several plastic shopping bags for trash and grossness, a couple small toys and books, change of clothes for the 2yo and spare pants for the middle 2 (constantly spilling something), and a package of glow sticks (not for while I am driving). I have a care care kit that includes cleaning supplies for the car and I always keep a box of tissues, roll of tp and spare feminine supplies in my car.